These days just about everyone has a high-end camera and can call themselves a photographer and that’s great. I love fellow photographers! But what sets professional photographers apart from all the others are the details; knowing just what setting, lighting, angle and pose work best for the individual. This is where I excel. I’ve always seen life through a creative lens and for the past 15 years, I’ve been photographing everyone from those in the entertainment industry, professional athletes, high level executives and really, anyone looking to put their best foot forward on film. Well, these days, more on digital media but you get the point! My goal is to help you set yourself apart from the competition, which is why when we work together, I want to make sure you’re comfortable. Prior to our session, we’ll have a phone consultation where I get to find out what your real motive is behind having professional photos taken. Be it, actor head shots, professional calling card, business rebrand or just for fun – I’m here to not only help you look your best, but also to make sure your photos have that extra something that will help you stand our from the rest. Take a look around my site and please contact me with any questions. 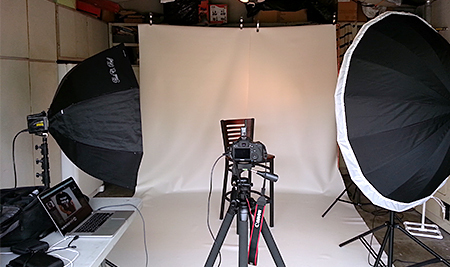 Located on the east side of Pasadena, I’ve built an 8x10 studio complete with both black and white backdrops and strobe flash to capture high quality imagery. Alternate backdrops can be arranged with advance notice.